Fri., March 10, 2017, 11:08 p.m.
NASHVILLE, Tenn. – Vanderbilt had every reason to give up in January, losing five of its first seven Southeastern Conference games. Instead, the Commodores stuck together and listened closely to first-year coach Bryce Drew. And it paid off. Riley LaChance scored five of his 18 points in overtime, and Vanderbilt topped No. 17 Florida 72-62 Friday night in the SEC tournament quarterfinals. “The resiliency of these guys has been phenomenal the last three weeks, and it was on display full force tonight,” Drew said. The Commodores (19-14) beat the Gators for second time in seven days to earn a berth Saturday in the semifinals against Mississippi or Arkansas. It’s the first time in the semifinals for Vanderbilt since 2013. Perhaps more importantly, the win should push Drew’s Commodores firmly into the NCAA Tournament for a second straight year. Florida (24-8) fought back from an eight-point deficit to force overtime thanks to KeVaughn Allen, who made a tying 3 with 1:42 left. The Gators had the ball with the game tied at 58 but missed two shots in the final seconds of regulation. “It was a good look,” Gators senior guard Kasey Hill said of his missed layup. Vanderbilt scored the first seven points of OT, with LaChance’s jumper with 4:02 to go putting the Commodores ahead to stay. Luke Kornet had 12 points and 10 rebounds for Vanderbilt, and Jeff Roberson finished with 16 points. Matthew Fisher-Davis added 11 points. The Commodores have won 10 of 13 overall, and Kornet said defense has been the key. “We’re all confident at every single moment, whether we’re down 10 or up 10 and continuing to just play good defense and try to win the game,” Kornet said. Allen and Hill each finished with 16 points for Florida. 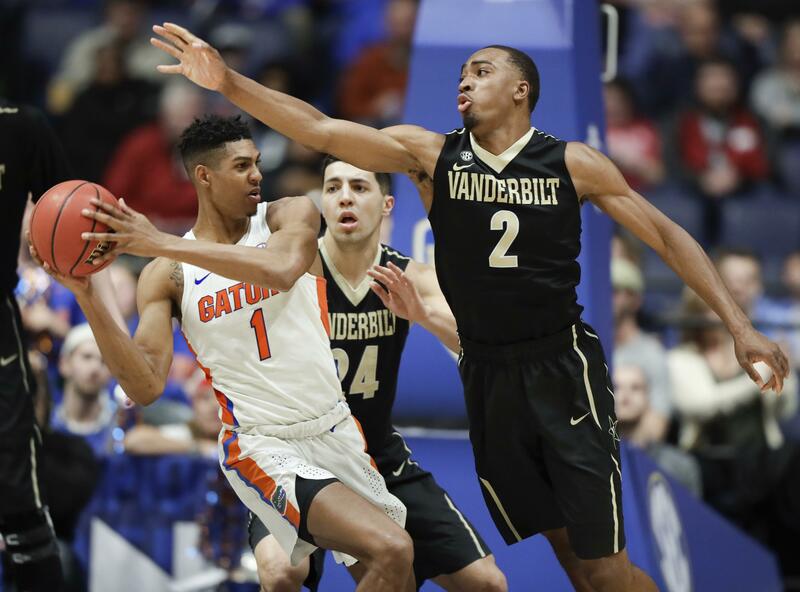 The Gators missed what would have been their first trip to the semifinals since 2014, and coach Mike White said he’ll be racking his brain until the NCAA Tournament bracket is announced trying to figure out what they could have done differently against Vandy. The SEC’s best 3-point shooters, fresh off beating Texas A&M for a third time this season, had the advantage from beyond the arc against the second-seeded Gators. The Commodores, who matched a season low with only five made 3s against the Gators last Saturday, went 11 of 27 (40.7 percent) from 3 compared to just 6 of 23 (26.1 percent) by Florida. The Commodores led 33-28 at halftime and were up by eight a couple times, the last with 3:27 left. The Gators, who lost the regular-season series by a combined four points, tied it up with eight straight points, with Allen’s 3 helping force overtime. Vanderbilt: Drew now has beaten White, the SEC coach of the year, three times in his first year with the Commodores. He also has two more wins in the SEC tournament than his predecessor, Kevin Stallings, managed over the past three seasons. Florida: Other losses over the past few days should keep the Gators a No. 4 seed in the NCAA Tournament along with a chance to open in Orlando. The best thing the Gators can hope for is not to see Vanderbilt anywhere in their bracket once the pairings are announced Sunday. White is 0-5 against Vanderbilt. The Gators dropped five spots after their loss to Vanderbilt to end the regular season and now have lost three of their last four. “We obviously have lost momentum,” White said. Vanderbilt: Ole Miss or Arkansas in the semifinals Saturday. Published: March 10, 2017, 11:08 p.m.